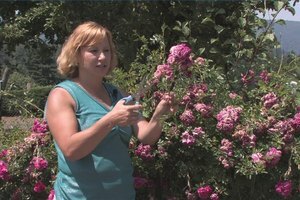 A Knock Out rose bush requires little pruning, but trimming it back in the early spring will promote new and healthy growth. 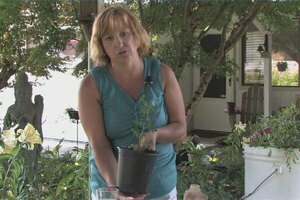 Prune back a Knock Out rose bush by one-third with helpful information from a sustainable gardener in this free video on roses. 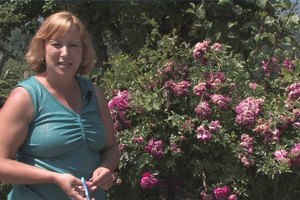 Hi, this is Yolanda Vanveen, and in this segment I'm going to talk about how to prune a Knockout Rose. Now Knockout Roses are a great addition to your garden or the end of your driveway or anywhere where you can just let them grow with very little maintenance, and basically you just put them in a sunny spot and you don't have to give them a lot of water and they'll continue to bloom all Summer through the Fall. They're just incredible, but theoretically the only time you really should prune them is in the Spring so before they really get growing a lot of times you can trim them back and then they'll fill in nice and lush for the Summer but periodically through the Summer I like to trim them back a little bit too because I find the suckers just kind of want to take over and especially if it's an older plant that's just really big it will keep growing and it is much nicer to trim out some of the spent flowers so that you can see some of the fresher flowers and it will encourage more growth and more flowers. So basically I just start hacking it back and theoretically you should actually cut it out where it's meeting another leaf line and at that corner you cut it at an angle so really you'd be cutting it at an angle right there but i have found that when you're cleaning things up you don't have to be too strict because as long as you're trimming it back and leaving and I always, but rule of thumb too is don't trim back more than one third of the plant at any one time. If it's really huge and out of control whack back one third, wait a month and then whack back another third because sometimes if you cut it back too much too it will shock the plant and there is not enough greenery for it to come back but I just keep whacking it and just kind of even it out and clean up any of the weeds or anything that is really straggly and theoretically again you don't have to do this. It looks good in the wild situation too but I just trim it back and as long as it fills in and you can see the other flowers it will continue to bloom and again when it gets cold in the Winter you can either leave it dormant like that or I trim it back in the Winter but make sure and leave at least 18 inches at all times on your Knockout Rose so it will continue to bloom and you can enjoy it because it is a delight in the garden. Yolanda Vanveen is a third-generation flower grower and sustainable gardener who lives in Kalama, Washington.